It’s never too late for your dog (or you) to learn a new trick! Is your pup in need of better manners? Or possibly a refresher course on how to come when called? Perhaps your dog is scared of strangers or has a hard time around other dogs. Use our expertise on obedience, hunting, tricks, interactive games, scientific training methods, and behavior modification to enhance your relationship with your best friend. Private Sessions, Day Training and Group Classes: Private lessons offer one-on-one training – typically in your home or off-site. These target specific behavior needs and help you and your pup progress quickly and successfully. Day training consists of our trainer coming to your home and working with your dog alone. This is a great option for those whose lifestyle does not permit the time necessary for private or group classes. Group lessons offer training for dogs and owners that need general pet information, tips, and tools for achieving basic manners and beyond. Training classes are also a great way to not only socialize your dog, but to continue their education on how to be a well behaved pooch! Eva is a Certified Dog Trainer and Behavior Counselor. She has always been a dog lover and has worked professionally with dogs since 2010. 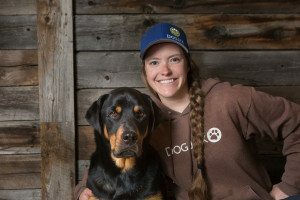 She started her work with dogs at the Santa Fe Animal Shelter assisting the Behavior Department with Behavior Modification for “unadoptable” dogs. Eva transitioned to Pet Dog Training in 2012. She is an Honors Graduate of The Academy for Dog Trainers and a Certified AKC Canine Good Citizen Evaluator. She uses scientific, evidence based training and does not employ the use of pain, fear or intimidation. Her training helps owners learn to communicate more clearly and effectively with their canine companions. This in turn enhances and develops the dog and human bond into one of love, trust and play. Puppy Socials – Free socialization class for puppies under 20 weeks. Focuses on confidence and comfort with new people, dogs, places, surfaces, sounds, body handling, acquired bite inhibition, and behavior problem prevention. Trail Dog Class – An intermediate level course focusing on proper trail etiquette for dogs. It is held on trails in the Jackson area and focuses on proper dog-dog and dog-human interactions as well as trail obedience. Basic Obedience –A beginner level course focusing on building basic commands like sit, down, stay, leave-it, come etc., as well as extinguishing unwanted behaviors like jumping up. Canine Good Citizen – The CGC Program teaches good manners to dogs and responsible dog ownership to their owners. The 10-step Canine Good Citizen test is a non-competitive test for all dogs, including purebreds and mixed breeds. The CGC award is a prerequisite for many therapy dog groups. Some homeowner’s insurance companies are encouraging CGC testing, and an increasing number of apartments and condos require that resident dogs pass the CGC test. The CGC Program also includes the AKC CGC℠ Responsible Dog Owner Pledge. Do I have to use food to train my dog? You don’t have to use any particular tool to train your dog. Professionals like food because it is one of the most powerful motivators in animal training. The reality is that you get more strongly conditioned behavior if you do not limit yourself to praise alone. Another advantage of food is that you can use it to target the dog into position. Food therefore has two roles: as target (“lure”) and as reward. Training with positive reinforcement allows the dog to relax and learn, and strengthens the bond between you and the dog. Over time, you can expect “more for your money,” that is more behaviors for fewer treats. You will also become skillful at incorporating other rewards into training. You can’t bribe a dog for doing something he doesn’t even yet have in his repertoire! Put yourself in his place. Imagine that someone said “palana.” What would you do? Nothing, because you don’t understand what that person wants you to do let alone why you should do it. Physically placing your dog into position slows down learning and has negative side effects. Using a target allows you to elegantly obtain the correct behavior. Certainly not as frequently as for a newer behavior, but yes, maintenance of established behavior with (concealed) intermittent rewards is a must. There is no free lunch in behavior. Think of it this way: you have to feed your dog anyway. You can give it all to him for free in a bowl or you can reserve part of his daily caloric intake and make him earn it! Also, don’t forget that there are other rewards besides food: everyday things such as play, sniffing, door opening, car rides and access to other dogs can also be used to reward established behavior. A crate is a safe, comfortable place that most dogs voluntarily use when the door is left open. How might you treat an untrained human toddler when unsupervised? Would you consider it “cruel” to leave her in a crib and “kind” to let her wander around? Crating also prompts dogs to hold their bladder and bowels, facilitating housetraining. I have heard that playing tug of war causes aggression. Is this true? The only study ever done found no correlation between dogs that play tug and aggression. If you teach your dog to “take” and “out” on cue and cancel the game if he breaks one of these rules, there is no reason to deprive your dog of this fun and efficient energy burner. Tired dogs are well-behaved dogs. Fetch is another great game to play. How long will it take to house-train my puppy? Puppies don’t hold on as well as adults. If you adhere to a strict schedule, taking them out many times a day, most puppies can be house-trained in a few weeks. Reward the puppy immediately when he eliminates outside with both verbal praise and a food treat. This means you must accompany him out; otherwise your reward will be too late. Confine the puppy to one puppy-proofed room and supervise him so there is no way he can make a mistake without you interrupting. When you see him winding up to eliminate, interrupt him and hustle him outside. Praise when he finishes here. When you can’t supervise, crate him (up to an hour at a stretch – don’t force him to soil his crate or else you lose its value as a housetraining tool). Don’t punish accidents, especially after the fact. Late punishments, even a few seconds late, are not associated with previous behavior and are abusive. My puppy keeps nipping me!! What should I do? If you watch a litter of puppies playing, you’ll notice that they spend most of their time biting each other. This is normal puppy behavior. When you take a puppy from a litter and into your home, he will start play-biting you. A puppy has very sharp teeth but weak jaws. This means the puppy can cause pain when biting but cannot cause severe damage. An adult dog has duller teeth but a powerful jaw, capable of mutilating damage. It is therefore important to teach a puppy to control the force of his biting before teaching him to not play-bite at all. This way, he grows up conditioned with a softer mouth that is less likely to do damage if he should ever bite. This is known as “acquired bite inhibition,” an important line of defense against aggression.